Pepperspectives: "Signs" of a Bubble in Silicon Valley? "Signs" of a Bubble in Silicon Valley? Is there a technology bubble? That is the question everyone is asking in Silicon Valley. Those who believe that there is a bubble point to the billboard advertisements along Highway 101 to support their case. Their argument is that the last time we saw billboard advertisements from technology companies was during The Bubble in 1999. Well, they are right about one thing: the tech billboards are back! And, even more noteworthy is that many of these billboards are not even promoting products or services. Rather, they are there to recruit new employees! At 8.3% unemployment, is there anywhere else in the United States that has a glut of billboard advertisements to recruit employees? 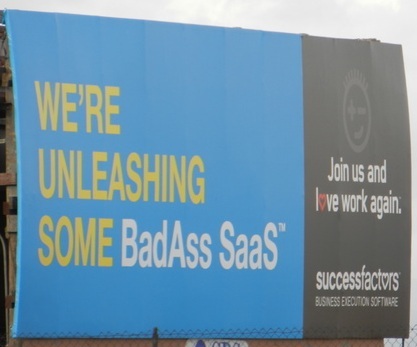 Below are a few of the many recruiting billboards in Silicon Valley. So, back to the question. Do these billboards suggest that we are in a bubble? I don't believe so. I think they highlight what an incredible period of innovation we are experiencing and that the bottleneck for growth is engineering talent. Mobile Ecosystem - With the meteoric adoption of smartphones & tablets (700M will ship in 2012 = 2x PCs) and the emergence of the application economy (25B apps downloaded on Apple alone), an entirely new computer ecosystem is exploding before our eyes. Social Media - Nearly every business, whether direct-to-consumer or enterprise-focused, is being impacted by the fact that there are a billion people actively participating in online communities using their real identities. Cloud Computing - A massive IT upgrade cycle is underway as enterprises shift their infrastructure from in-house to cloud-based deployments. Virtually every layer of IT infrastructure is being rewritten for this new paradigm. The main difference between Today and The Bubble of '99 is that there is serious end-customer demand for the products and services being created and there are effective revenue models with which to build a business. As a result, the successful startups today have real businesses with growing revenue and a path to profitability. In short, the companies currently paying for billboard advertisements are not startups with zero revenue, but rather successful and growing businesses. In order to build products and services on top of the emerging platforms and to support the growth of their underlying businesses, startups need engineers. It is engineers that build new products and, unfortunately, we don't have sufficient talent to fill those roles. This is especially true when so many young engineers are choosing to launch their own startups rather than joining established companies. At many of the companies I'm involved with, management's biggest concern and request for help is recruiting. Talent is the constrained resource. Hence, the rationale for the recruiting billboards. What do you think the billboards say about the Tech economy? P.S. Credit for the photos goes to another fantastic TaskRabbit. An amazing stat from Simon Khalaf, CEO of Flurry: "An Excellent article. I would add (just because I love analytics) that in 2000 there were only 32m fixed line broadband users worldwide. In 2012, mobile broadband will reach 1.156B worldwide users :-)"
I would like to thank you for the efforts you have made while writing this post. I am hoping for the best work of the same from you in future. This is a good place for the time spent a. I just found your blog informative and wanted to say I really enjoyed reading your messages. Amazing weblog structure! You made brilliant points there. I made a search on the topic and found the majority peoples will agree with your blog post . I really have learned a lot from you.Thanks for sharing.So many people have come to your blog. Quotes from this article: "If prices keeps going up at this rate for another six months, we will have a bubble..." followed by "The housing market may or may not be approaching bubble territory..." followed by "...the housing market is still far from bubble territory." Opinion1+Opinion 2+Opinion 3 = nothing but opinions. Not a fact to be seen anywhere. To see more info please visit http://essayswriters.org/academic-writing/. he program provides patient services at key points during the critical first days following discharge, and while outcomes data is not yet available, hospital officials have recognized a trend of positive results. I do think there are fundamental drivers that support the pace of innovation in Silicon Valley right now. Is there away to do this on the Nexus without going thru the contact list to make a call? Gotta b an easier way. That is very good comment you shared.Thank you so much that for you shared those things with us.I'm wishing you to carry on with your achivments. All the best. I learn something new and challenging on websites I stumbleupon on a daily basis. It's always exciting to read through content from other writers and use something from their web sites. Hi, I'm Doug Pepper. I invest in SaaS, mobile, and internet startups. I am a Managing Director at Shasta Ventures.